Someone has finally made a phone as lackluster as the struggling Windows Phone OS that powers it. The HTC 8XT is a colorful handset that bears a striking resemblance to last year’s Windows Phone 8X but doesn’t bring anything new to the table, and once you get past the pretty colors, you won’t find much else to like about it. While the 8X was by far the most attractive Windows Phone of last year, with competitive specs that positioned it favorably against Nokia’s Lumia handsets and the hordes of Android phones, HTC’s latest Windows Phone seems as if it’s still stuck in the past. It’s inferior to its predecessor in almost every way. Windows Phone fans have been waiting for a phone that is legitimately, unequivocally better than the iPhone. And here it is! A Windows Phone that outclasses the iPhone. Just not any version of the iPhone sold in the last few years. The 8XT has the exact same dimensions as the 8X before it, though it sports a few minor cosmetic differences. The bottom edge of the 8XT is a different shade of blue from the rest of the body, and the buttons are easier to press than those on the 8X. Although the phone looks good, I wasn’t a big fan of how the 8XT felt in my hand: Its square corners dug into my palm, and I had to keep shifting my grip to access the navigation buttons at the bottom of the device. The soft-touch material on the 8XT is the same as that on the 8X; I wish HTC had chosen to construct this phone out of something with a more premium feel to it. Unlike the 8X, the 8XT features HTC’s Boom Sound technology and has two stereo speakers on the front face. They aren’t as loud as the speakers on the HTC One, which also boasts Boom Sound, but they are a huge step up from the mono speaker on the 8X. The bezel surrounding the 8XT’s 4.3-inch display isn’t raised, so you have to be careful when setting the phone face down, as you risk scratching the screen. The 8XT’s display resolution is actually lower than that of the 8X (480p versus 720p), and you’ll certainly notice the difference when you’re looking at photos or reading text. A smidgen of motion blur is present during gameplay and movie viewing, which can be distracting. The 8XT (top) is similar to the 8X (bottom) in design and shape. I find the 8XT’s build quality underwhelming. The volume, power, and camera buttons feel mushy, and the phone doesn’t seem as if it could survive a fall onto carpet, let alone pavement. After handling HTC’s more recent handsets, I’m disappointed that the company chose to rehash an old design rather than come up with something fresh. The 8XT carries a slower processor than the 8X does, though I didn’t notice much difference in performance while using it. The phone was responsive to my touch, and I encountered no lag while jumping around apps or playing games. One aspect of the 8XT that really irks me, however, is that the phone comes with only 8GB of internal storage and the MicroSD card is incredibly difficult to access. I had to use a special tool to remove the back of the phone in order to access the slot, and I can easily see someone damaging their phone while trying to reach the slot. Another big drawback of the device is its battery life: The 8XT could barely make it past 6 hours of normal use—taking photos, browsing the Web, checking email—without my scrambling for a power outlet. The battery is nonremovable, so you would be wise to invest in an extra cable or even a battery pack if you’re going to be out for a while. The back cover of the phone is a huge pain to remove. Although you shouldn’t run into any performance problems while using the 8XT, that microscopic amount of on-board storage really hampers what you can do with the phone. You’ll have to juggle what lives on your phone and what lives on the cloud, and using streaming services such as Netflix or Spotify for most of your entertainment needs wouldn’t be a bad idea. Apps should be another area of concern if you plan on picking up this handset. Windows Phone continues to hold its own against iOS and Android, but many app developers flat-out refuse to bring their apps to the platform. Facebook and Google have zero presence on the Windows Phone marketplace, aside from a few knock-off apps that charge you to use the same services that are free on other mobile phones. The Facebook app that pops up in the app store was published by Microsoft, not Facebook proper. First-time smartphone users may get lost in the operating system’s countless menus and settings, while power users will likely be frustrated by Windows Phone’s various limitations and shortcomings. I still have my fingers crossed that Microsoft’s next update will fix the way the OS handles notifications, as right now they simply disappear into the ether if the app that triggered a notification isn’t a live tile on your home screen. Not that I’m saying that the 8XT would be any better if it ran Android, mind you, but it seems odd to me that HTC would intentionally pair such mediocre hardware with a phone OS that has its own problems. The 8-megapixel camera on the 8XT is as substandard as the rest of the device. Test photos came out murky with lots of artifacts, and using the flash instantly washed out the subject. HTC’s custom camera app feels like a stripped-down version of the HTC One camera app, but it does give you some control over your photo’s exposure, contrast, and white balance. This isn’t a phone you buy for taking pictures—you’re better off getting a stand-alone camera instead. I don’t know why HTC even bothered to make this phone. The 8XT is such a step backward from the 8X that calling it a successor is almost a joke. The screen is grainy, the camera is terrible, and you have next to no storage on the device. Combine all of that with a $100 price tag (and a two-year contract), and you have a phone that’s going nowhere fast. Even the most hard-core Windows Phone fans should do their best to avoid this one. This story, "Review: The HTC 8XT is better than the (original) iPhone" was originally published by TechHive. 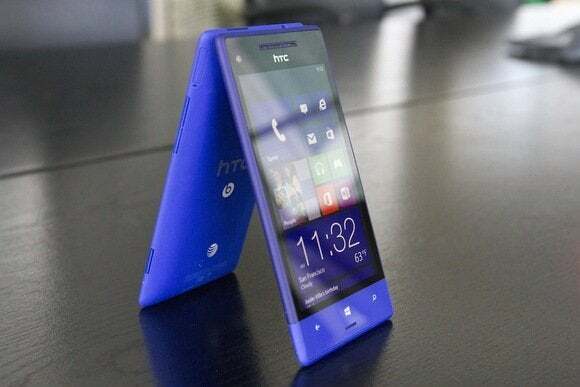 The HTC 8XT is a disappointing Windows Phone that's a step down from its predecessor in nearly every way.